A black and white negative of a portrait of Arthur Denyer (1896-1957). Arthur Walter Francis Denyer was born at Ballincollig, County Cork, Ireland, in 1896. He served in India, Africa and Europe during the First World War as a Sergeant Major in the 12th and 16th Royal Lancers. He came to Canada in 1927 and to Whitby in 1930, where he worked as a supervisor at the Ontario Hospital. He was President of the Royal Canadian Legion Branch 112 in 1956-1957 and in 1955 organized the Legion's Drumhead Service parade for Whitby's Centennial of incorporation as a town. He was a Noble Grand of Eastern Star Lodge IOOF and a member of the Benevolent Rebekah Lodge No. 132. Mr. Denyer died at Oshawa General Hospital on January 3, 1958 and is buried in St. John's Anglican Cemetery, Port Whitby. 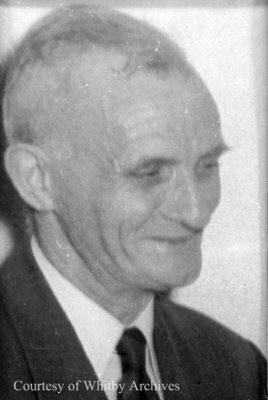 Arthur Walter Francis Denyer, 1957, Photographer Unknown. Whitby Archives A2016_017_033A.